Naturally 'Caves of Androzani' has got an awesomely high reputation as being one of the, if not THE, best story of the Eighties, rivalled perhaps only by the likes of 'The Curse of Fenric' or 'The Greatest Show In The Galaxy' or, in my opinion but not everybody else's, 'Remembrance of the Daleks' (It's good fun if nothing else isn't it). So when, a few months ago, I purchase 'The Caves of Androzani' on DVD I was expecting to be blown away by this 'awesome story', and the fact that it was the only regeneration story currently on DVD from the programme's 26-year-run, I was itching to view. What I got was a perfectly sound story, and I certainly can see why its reputation is so high, but it was still an anti-climax. I suppose if I delve deep into the characterisation of Holmes, and the detailed society and culture of Androzani Major/Minor I can indeed agree that it scores top marks on that level. I will first present my annoyances with the story. These are minor glitches overall and they are beside the notorious television remotes of Morgus and the unconvincing Magma creature (and somehow Graham Harper thought that it was terrifying, and even asked Peter Davison at the end of Episode 2 on the DVD commentary if he and Nicola thought it terrifying too!). But there are other things - mostly the fact that it is so much more of an 'adult' programme rather than a 'children/family' programme because there is very little action till up to the final episode and I found that, although I enjoyed it, my younger cousins tended to switch off a lot when watching it. Another thing is the incidental score - which IS effective in some places, but in others it can be very tedious. And I have to say that the mercenaries chasing the Doctor at the start of Episode 4 are terrible shots, and Cralper looks ridiculous as he runs stiffly with his tiny gun held at his waist, firing randomly. But lets move on to the much better things - and these are (apart from what I mentioned at the start) Davison's performance. The acting is excellent throughout - and I do agree that the performance of Davison at the end of Episode 3 is exceptionally good and hits the exact amount of anger and desperation without going outside of the Fifth Doctor's character, which I found was not the case when I recently watched 'The Visitation' where a lot of the Doctor's actions and manner of talking were not unlike Colin Baker's performance. It wasn't until I read Paul Clarke's review of this story that it suddenly hit home that the caves are actually sets and not really caves - I honestly never realised they were studio sets - obviously deep down I knew they were because of the picture quality, but I hadn't though about it till now. So excellent cave sets are evident - however Morgus' office is terribly bland, but the 'hologram' effects of Morgus talking to Chellak or Stotz are exceptional for the series. The main thing I love about Caves is the ending. Harper's direction coupled with Davison's performance is immense as he trudges on towards the TARDIS carrying Peri in his arms as is his performance in the TARDIS in what is a spectacular regeneration scene as you all will agree - but they do cheat slightly by flooding the camera with light effects so that they just switch clips from Davison to Baker in between but this doesn't detract. Overall then - Caves is a perfectly good story, and in comparison to 'The Three Doctors' which I'm watching now it excels miles. It's just that the heaps of praise was raising expectations a little too high. I shouldn't care about these people. They're loathsome. The only one who's not complete slime is Chellak and he's the least interesting character, a sheep among wolves. He's not really a bad guy underneath, but he gets pushed around by everyone else, he's happy to execute the Doctor and Peri for no good reason and basically he's a loser. Everyone else is slime and you're looking forward to their deaths, hopefully in humiliating and painful ways. The Caves of Androzani arguably shouldn't work. On first broadcast, when I saw it as a child, for me to an extent it didn't. It's bleak and unpleasant, like bathing in used engine oil. It certainly shouldn't have been taken as any kind of template. This is the kind of story that works in the hands of Peter Davison, Robert Holmes and Graeme Harper, but in the hands of Steve Cole or Trevor Baxendale makes you want to plant bombs in bookshops. Nevertheless in 1984 it worked like crazy. As so often 'twas Robert Holmes, the grand old man of Doctor Who, who could break the rules. His characters aren't just bastards. They're unbelievable screaming motherfuckers. Holmes hit a roll, a momentum with which he created a cast any one of whom could on their own have been the "unmatched throughout the series" highlight of another story. Sharaz Jek = work of genius. Stotz = has me backing away from the television. Morgus = makes the above look like Disney heroines. "Have the lift maintenance engineer shot." It's profoundly satisfying to see him get what he deserves, from Krau Timmin and then from Jek. I'm not sure what that glowing special effect did to him in episode four, but I'm happy to assume that it wasn't nice. I could talk about these people for hours. Best of all, they're all completely different. It's no identikit parade of faceless macho mannequins, but a rich mix of villains that in that department outdoes just about any other work of fiction I can think of. Stotz is fascinating even before we see horrors like his terrifying scene with Krelper and the pill. He's a genuinely clever psychopath. Then of course there's Jek. I discussed the others first to get them out of the way, since here there's so much to say. I'll be here a while. Everyone knows that Christopher Gable went in to read for another part, but on seeing the script fell in love with Sharaz Jek and went to Graeme Harper to ask for him instead. Forget the script for a moment. I've already discussed how astonishing it is that Robert Holmes pulled off what he did here, but I'm about to address the nuts and bolts of TV production. For Graeme Harper, the most script's terrifying line must have been: "You think bullets could stop me now?" That's the acid test. A bad actor or half-hearted direction could have sunk it like a stone and basically killed the whole story, which had all been building up to that confrontation. Why don't Morgus and Stotz just blast down Jek on the spot? Think about it. The guy should be Swiss cheese. In any other story, we'd be rolling our eyes and hooting at the TV... but the televised production doesn't even let you blink. You believe Jek! One truly feels that mere bullets wouldn't do the job. Admittedly the script has already made it clear that he's extremely hard to kill, but by that point our guts are screaming that this man is practically superhuman. A further point of interest is that Sharaz Jek is an operatic character in a grittily realistic production. 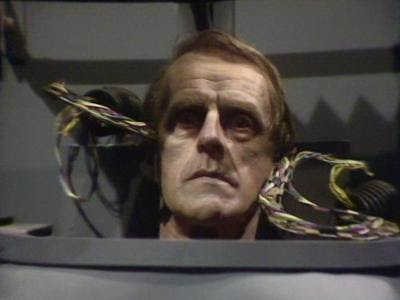 In a perverse way John Normington plays up Morgus by playing him down, with that psychotically tight self-control, but the world of Androzani is a million miles away from the plastic BBC corridors of much eighties Doctor Who. It has bullets, not laser beams. Its tough guys feel like tough guys, not ballet dancers and RADA graduates. Nevertheless amidst all this is a richly theatrical creation, using language as flamboyant as anything Holmes ever wrote. "You have the mouth of a prattling jackanapes." I'd kill to hear a Hollywood action hero say that. You can roll it around your tongue like wine, but furthermore it characterises Jek. It's horror as poetry, with luscious descriptions of grossness. When Jek says he wants Morgus's head, that's no metaphor. "Congealed in its own evil blood." "The flesh boiled, hanging from the bone." Jek's obsessed with physicality. He's besotted with Peri's beauty, mentally shattered by his own deformity and speaking a language of blood. It's perfect that he ended up being played by a professional dancer. Eventually of course Jek becomes the only sympathetic character! He's acting from pure motives rather than greed. Love, or at least his twisted version, and hatred. They're beautiful in their clarity and he's dominated by them. He's like a terrifying child. Then there's his best line. "I am mad." I can't believe I'm reviewing a Davison story and I haven't talked about Peter Davison yet. This is one of those rare stories which you couldn't quite do with any other Doctor. The 5th Doctor, especially in Season 21, was the last good man in a bleak universe, which ultimately ended with him giving his life to become Colin Baker. Seasons 21 and 22 are twin epitomes of grossness, but in opposite ways. Colin Baker's era had a flamboyance, a larger than life quality that at its best gave us the likes of Vengeance on Varos. A Davison story on the other hand was always more human and real, as was exemplified in this final farewell. He's a hero in the fullest sense. For the Doctor as a character, I think this remains his finest hour in all his lives since 1963. The Colin Baker era's stabs at tragedy (Lytton, Oscar Botcherby) were always fumbling and awkward. In contrast there's something uncomfortable about Resurrection of the Daleks and Caves of Androzani that few eras ever attained. Plus of course this story shows Davison's dark sense of humour, letting him stand up to the psychos with deliciously dry sarcasm that's flippant but always purposeful. Watch his first scene with Chellak. That line where he asks for a chair. He's deliberately testing the general. Then in the detention cell in episode one he's asking all the right questions, having already basically worked out the truth about both Salateen and Morgus. This is my 5th Doctor, the one who had Turlough pegged almost from the beginning but never said a word. His finest moment in this finest moment is of course part three's cliffhanger. Obviously it ends with Davison's toe-tingling "not going to let you stop me now" speech, but personally I love the whole scene all the way from "Ah, Stotzy, have you had a good rest?" and "Sorry, seems to be locked". Even his relationship with Peri is interesting. She's just as sarcastic, whiny and unenthusiastic as she would be in Season 22, but Davison lets it all roll off him. He's so much more tolerant than in his early days with Adric, Nyssa and Tegan. In fairness he didn't choose any of them; they're miscellaneous orphans who stowed away or got dumped on him, and it's already the end of Castrovalva before he's in a position to do anything about it. (Note that he spends the entirety of Season Nineteen trying to get rid of Tegan, albeit at her request, and he's not exactly reluctant to lose her when they finally reach Heathrow in Time-Flight.) Peri on the other hand was offered her place on the TARDIS. Plus of course she has the right idea. Androzani really is horrible. Anyone with a brain would want to get away. The Doctor is the hero, but she's the ordinary girl trapped in a nightmare. She's terrified by Sharaz Jek, to the point where she jumps at the Doctor's hand hitting her shoulder. The regeneration is different too. Everyone knows about the fan theory about the episode three cliffhanger, with the Doctor feeling woozy just when Harper reused the regeneration special effect. He pulls himself together and we get on with the scene. However there's a further regeneration foreshadowing when the Doctor goes down for the milk of the Queen Bat and hears voices, a multiple echo of Sharaz Jek saying, "She's dying, Doctor." Eventually the old faces parade works surprisingly well, trumping the similar idea at the end of Logopolis by bringing the actors into the studio to record new lines. We'd never seen a regeneration like this before, a slow poisoning in which the Doctor basically spends four episodes dying by degrees. Even he says, "It feels different this time." Continuity menks might surmise that Androzani's backstory is similar to that of Robots of Death. "Where are you from, Earth?" "As they used to say on Earth, every cloud has a strontium lining." There's also the fact that Jek's androids get confused by the Doctor's alien physiology, making it look like a fairly human-centric universe. Oh, and Morgus's asides to camera. What the hell? As soon as your attention's been drawn to them, they're unbelievable. I love them. I like the plot. It's hardly an original observation, but I'll say it again... The Caves of Androzani is an SF historical. There aren't any diabolical menaces or plans to destroy the universe, but simply the passion and violence of the characters. We don't need aliens. Everyone's quite enough of a threat to each other. Okay, there's the Magma Beast, but it's little more than a lava flow on legs. There's nothing intelligent or consciously antagonistic about it. Meanwhile for once the Doctor isn't trying to beat the bad guy or save the world, but simply wants to get back to the TARDIS. I'd always vaguely approved of Robert Holmes, but rewatching all these old stories has heightened my appreciation of him. He's a storyteller, a wit and a wordsmith, but moreover time after time he does things with Doctor Who that no one before or since has thought to do. The Caves of Androzani is unique. It's spiky, uncomfortable and I didn't particularly enjoy it when I was eleven, but it's a breathtaking achievement. My conscience is clear... but the Presidium will find my actions treasonable. But I honestly don't look at Caves and think Doctor Who. I look at Caves and see a crossover between Doctor Who and Blake's 7. Of course, there was another one - The Sun Makers, also by Robert Holmes, but also made before the first episode of Blake's 7 was filmed, let alone screened. Like Blake's 7, Caves shows a universe full of utter bastards with nice lines in wit who as likely to insult you as shoot you in the back. Androzani Minor could be any planet in B7, a barren quarry with caves filled with trigger-happy troopers, native monsters and amusing-looking androids. The army is fighting a small band of rebels lead by 'an evil renegade', and Sharaz Jek does kind of resemble a mixture of Roj Blake and Kerr Avon - a sinister bloke in black leather who obsesses about a woman he hardly knows and is fighting a wide-scale war against his society more out of revenge than ideology. Morgus resembles Servalan in many ways (bar, obviously, gender and fashion sense): a high-placed official in a plush office, already with great power over their world and prepared to kill and murder their way until they are more powerful than the President. And like Servalan, Morgus is deposed and left on the run trying to locate the key to restoring their position - in the former, it's the spaceship Liberator, in the latter, it's a stock of pure Spectrox. And like Blake's 7, the story ends with most of the guest cast dead and no interest in what will happen to society following this adventure. Androzani Major may flourish or collapse, and the regulars have no interest in it, either way. But it is B7 with its small good humor ripped away. While Stotz and Krelper's bitching recalls the repartee between Avon and Vila, Stotz has no real camaraderie with Krelper, evidence by the loud and uncomfortable scene where he beats Krelper up, holds him over a cliff, slashes at his face with a knife and throws a cyanide capsule down his throat. The rebels in Blake's 7 were at least attempting to fight something more corrupt and evil than they were - on Androzani Minor, everyone is ironically on the same side, but still determined to wipe each other out. Morgus runs the army, Morgus runs Stotz and the gun runners, and Sharaz Jek is thus dependent on his hated enemy who has masterminded this entire war in order for him to stay rich and profitable. Of course, it's around this point we say The Caves of Androzani is the fifth Doctor's finest hour. Well, it's true, isn't it? I believe Davison's Doctor has quite a few good hours, but this still beats out in quality. For the first episode or so, it's as though Davison is playing the fourth Doctor. You can easily imagine Tom Baker casually wandering through the caves, baiting Chellak, and all the while doing that wonderful expression of his grin collapsing into a grimace as he realizes what a horrible place this is. But the desperation the Doctor develops upon learning he is dead meat is definitely playing to Davison's strengths. The third episode cliffhanger with the Doctor simultaneously threatened by a bullet to the head, a fatal crash-landing and Spectrox Toxaemia is justly famous for its tension. But when seen in context, after the rest of the fifth Doctor's era, and the cliffhanger gets even better. When I reviewed Planet of Fire I noticed that the new, tougher fifth Doctor has developed a 'I don't have time for this' attitude when it comes to his companions, enemies and the universe in general. Caves takes this and cranks this up to eleven. While the end of the first episode has the Doctor as usual trying to understand this situation and work out what's going on, by the end of the second he has no time for the politics of the Androzani twins. When he sees Morgus and realizes who is really in control of this 'pathetic local war', he loses all interest. He doesn't care, he's got Peri to worry about and he's not going to let juggling the big picture and the little picture lose him his friend. It can't be argued the Doctor has not been that successful with his companions. Although Adric sacrificed himself nobly trying to save a world of people he'd never met (for a species he regularly found annoying), he ultimately died for nothing and the Doctor couldn't save him. When Nyssa left the Doctor, it wasn't because she had found a place she wanted to live and enjoy herself, it was because she was faced with a problem so big the Doctor wasn't prepared to hang around in fix so she refused to go with him. The Doctor could easily feel proud of Nyssa's compassion and bravery, it's not the happy ending she deserved and the Doctor obviously felt he should provide. Turlough seems to decide to quit the TARDIS the moment the Doctor snaps at him that he's had enough of the Trion's secrecy, and was prepared to face arrest, exile, maybe even execution rather continuing traveling with the Time Lord. Kamelion was killed by the Doctor himself, fatally wounding the android and then crushing the poor thing. And Tegan, of course, ran out on the Doctor when she saw him pick up a gun and prepare to commit cold-blooded murder - and ironically changed her mind at the last moment, even though she never found out the Doctor didn't kill Davros. Even in the comic strips, the Doctor was unlucky with friends. Sir Justin in The Tides of Time sacrifices himself for something, but the Doctor shouldn't have let it get that far. In The Moderator, Gus Goodman was killed defending the Doctor, and died with the miserable realization he'd never get home - all because the Doctor was sarky to a giant cane toad. Ultimately, Big Finish's decision to put a whole season between Planet of Fire and The Caves of Androzani is uncomfortable to put it mildly. Caves is clearly set a very short time after Planet and why not? Robert Holmes was hardly writing the scripts with the proviso in twenty years time missing audio adventures were being recorded. Also, just putting Erimem in there ruins the feel. Unless she also leaves the Doctor on bad terms, it shoots the whole point of Caves through the head. The Doctor HAS to save Peri because he has spectacularly failed to save any other companion. But if Erimem does suffer this fate, it makes the Doctor and Peri suspiciously cheerful at the start of this story. Damned either way, really, but the audios definitely remove the poignancy of the Doctor dying saving the life of someone he's only known for a few days.The Caves of Androzani also manages what Resurrection of the Daleks failed at - that is, it puts the Doctor on the sidelines of action but still makes him vital to the plot. This is one hell of a difficult trick, so there's no shame in failing at it. Shame in stupidly trying it again and again, though. The Doctor manages to meet every character bar Timmin, and has a domino effect on those around him. If he didn't visit Androzani Minor, Stotz wouldn't have lost his consignment of arms, Sharaz Jek would never have seen Peri, Salateen wouldn't have been able to escape and thus the whole balance of power would have remained the same. Yet while the Doctor's mere presence (and that of Peri) causes the whole adventure to happen, no one's interested in him in anything other than target practice - they just have different reasons for doing so. Morgus wants the Doctor dead because he's probably a spy; Chellak wants the Doctor dead first because he's ordered and then because he thinks he's a traitor; Sharaz Jek wants the Doctor dead because he's annoying and irritating; Stotz wants the Doctor dead because he might be a scapegoat and the gun runner is something of a sadist; Krelper wants the Doctor dead because he likes killing people and the Doctor's survived so far; Salateen even goes so far as to defend the Doctor, but it's more because he's honest rather than he cares for the Time Lord's safety; even the Magma Beast wants the Doctor dead, but just because he's hungry. Tellingly, the Doctor barely glances at these characters when he passes their corpses. On top of that, the Doctor's fate is continually being sealed by those around him, and ironically they seal their own fate as well. Chellak admits he believes that the Doctor and Peri are innocent, but can't be bothered to try and save their lives - and thus this leads to him being the last survivor of his army, drowned in boiling mud. Salateen abandons the Doctor but keeps Peri prisoner as insurance to help him - and ends up being the first shot dead by the androids. If Sharaz Jek had put his foot down and kept the Doctor on Androzani Minor, he would have discovered Peri's condition sooner and been in a better position to save her. Morgus' casual decision to order the time travelers shot is what ultimately leads to him facing Sharaz Jek face to face and paying the price. Every character is cruel, rude and callous - only Jek has any redeeming quality: he wants to keep Peri alive and safe, and although he's causing mass panic and confusion on Major, he'd happily hand over his Spectrox and save them as long as Morgus was dead. But he's still not a nice guy and he suffers the same fate as the others. Only three characters survive this story - Peri, Timmin and the Doctor (and technically the Doctor doesn't), and this highlights the cold justice in this story. In this world, if you're nasty, you pay the price. The Doctor, like his third self, gets caught up in this through his own curiosity and by putting Peri in danger is ultimately doomed. But the Doctor gets a second chance because he plans to make amends, to save Peri's life whatever the cost. Peri never hurts or want to hurt anyone in the story, even trying to help Jek. Timmin is seemingly the exception, as she seizes control of Morgus' empire without a shot being fired and effectively wins. However, we know that the mud burst has wiped out all the supply of Spectrox and most likely the bats as well, so Timmin has just taken over a planet of people about to die of old age catching up. And how long before Timmin finds others conspiring to overthrow her? Timmin's nastiness is subtle and cunning, and the karma she's facing will be just as insidious. Peri manages very well in this story, though like the Doctor, she's more a catalyst for change than a player in the story. Her relationship with the Doctor in part one is relaxed and friendly, and it's as though being around Peri allows the Doctor to assume a more 'Doctorish', absent-minded, curious quality, as if it's a fresh start. The situations they face show Peri to be a real person - she's slightly clumsy, scared of being arrested by people with guns and being lusted after disfigured self-proclaimed maniacs. 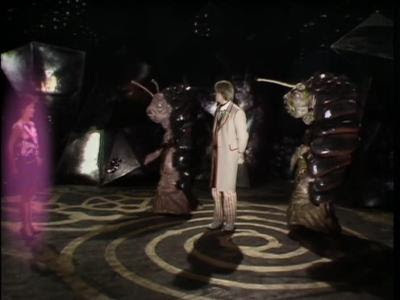 Peri is able to cope with the events in her first story because they are easily compared to her old life - being unintentionally kidnapped by the Doctor and Turlough can be dealt with because she was planning to abscond with two strange men already; facing down the Master (and Kamelion) is easy because she has dealt with annoying arrogant men for most of her life; and travelling to Sarn is just Lanzarote with fewer cafes. But here she's been captured by soldiers, threatened with death by firing squad, feeling very ill and sick. If she has anything to compare it to, it's... being captured by soldiers, threatened with death by firing squad and feeling very ill and sick. She jumped into the TARDIS because she liked the Doctor and wanted to travel, but she didn't sign on for this and she's scared. Fair enough. But seeing the Doctor dying in front of her cracks her resolve which kept her going throughout the adventure. She doesn't sob because she wants to go home or is scared of being trapped in the TARDIS, it's because her friend is dying! Peri is reassuringly human, even if it's becoming clear she's not the perfect time traveling companion. Ultimately, Caves is a story that should be a one-off. It throws the Doctor into the deep end specifically to make him sink, because it's ludicrous for him to swim. Caves wouldn't work if the Doctor survived the end, and if he kept trying to resolve the Spectrox war, it would be a completely different story - and not half as bleak and lethal as the one we see. Yes, Caves is brilliant but that's precisely because it's a story that can only be told once. Like Genesis of the Daleks - it'd be the height of stupidity to tell an identical story when the original did it so well. Yet, the production team decided to pop back to this dark, B7 universe where life is cheap, happy endings rare and nice people surviving are even rarer. Like the Doctor's involvement, Caves had something of a chain reaction on Doctor Who itself. The following season was one long attempt to repeat Caves' atmosphere and success - a nice aim, but flawed from the outset. Apart from anything else, finding subterranean settings full of bastards and villains drooling over Peri got old very quickly. Caves ended the fifth Doctor's era and it's a sad but true fact that Doctor Who was on shaky ground ever since. From 1985 onwards it was on a precipice of cancellation, and it ultimately fell despite getting its act together at the last moment - quite like the Doctor here. Another thing I noticed that Holmes was also responsible for The Brain of Morbius, in which we are shown the Doctor is in his twelfth body by the time he's Tom Baker, and The Deadly Assassin where we learn Time Lords only get thirteen bodies. It's hard not to see some significance in the dying Doctor's wondering if he will regenerate - as it is implied he's on his last life, and might explain why he's about to go through his most difficult regeneration so far. In any case, the idea that the Doctor goes through all he has to in Caves even though he knows he's really going to die this time, just makes him more of a hero.The Caves of Androzani is damn-near perfect. I've been going through a semi-orderly survey of Doctor Who stories  not perhaps the exhaustive chronological crawl that some other fans here have done, but rather a selective hunt and peck, targeting stories generally regarded as classics, as well as few I remember vividly from my childhood. In some cases, I've certainly been delighted to find stories worthier than I expected ('Death to the Daleks,' 'The Leisure Hive,' e.g. ), but in others I've been disappointed by some that didn't, in my estimation, live up to their stellar reputations ('City of Death' and 'The Dalek Invasion of Earth' were two particularly sad surprises, I thought). So I wasn't sure what I would make of 'The Caves of Androzani,' a story about which I remembered little from my own first experience with it as a teenager. The story seems to be universally loved by fanboys, and yet it is also is a 'hard-edged' war story script-edited by Eric Saward, whose vision for the series is not one I always appreciate. Add to this the fact that the venerable 'Discontinuity Guide' calls it 'overrated,' and I was a little bit nervous. Then again, I've found Robert Holmes's reputation as the grand old man of Doctor Who scripts to be largely justified, and even when his stories are disappointing in some ways (as I found 'The Talons of Weng-Chiang' to be), they usually provide some redeeming elements of characterization or humor. And indeed, as I got into the first episode of 'The Caves of Androzani,' I found it to play like Holmes's homage to the Saward years. In fact, you could say the plot 'out-Sawards' Saward in its grittiness and its focus on militarism (there not much sci-fi or philosophy at work here). But it doesn't take long to see how Holmes's gift for dramatization is raising this story above superficially similar Saward efforts like 'Resurrection of the Daleks' and 'Earthshock.' The plot is economical, yet satisfyingly knotty, with a lot of social and political commentary lining its edges, and the characters, while perhaps simple, are overall as beautifully drawn as we might hope. But the *real* villain of the piece, of course, is not Jek at all, but rather his old friend and rival Morgus, and this is where Holmes's satire really comes into play. If anything, Morgus is an even flatter character than Jek, but Holmes's clear concept of him makes him believably awful, and even quietly frightening. (Compare the character to the buffoonish, bellowing Henry van Statten in 'Dalek,' and you tell me which is the better realization of a Super Capitalist as Villain.) Holmes's treatment of the character is enormously cynical, and the way in which Morgus tries to hitch his rapacious business interests to political ideals ("Patriotism is our only viewpoint") resonates just as well in the era of Halliburton as it must have in the Reagan/Thatcher-dominated 1980s. And of course, like many contemporary giants of commerce, Morgus is ultimately shown to have his fingers in too many pies at once, and given this fact it's probably a mercy that he meets a quick end at the hands of his archenemy rather than facing the legal and political annihilation that would wait for him if he survived. John Normington gives a much more contained performance than Christopher Gable here, but it's no less effective. He is steely and unblinking in the role, and while the character's asides to the camera are a bit stagey and strange (is Morgus the narrator? ), the actor plays them so well that they never become a joke. And although the overall tone of the story is serious and dark, Holmes does find ways to slip in his trademark wit, however grimly. He does so in extremely subtle ways, tying the humor in to the subject matter to the point where it may not seem funny the first time (as when Peri jokes about her rash early on - "I don't expect we'll die of it within the next hour" - little realizing she actually *has* been infected with a lethal disease), but which improves with subsequent viewings. Morgus's conversations with the President provide some dry amusement too, with the politician cheerfully suggesting to the businessman that Jek's terms may have to be accepted (and Morgus's head sacrificed) if the situation is not resolved soon. 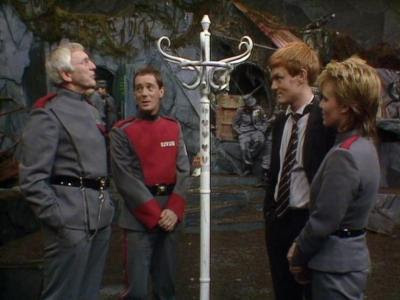 And Episode Four in particular contains many darkly funny surprises, notably Stotz's smiling betrayal of his fellows (double-crosses like this are common in Doctor Who, but rarely do they feel so believable, or so shocking), and Krau Timmin's cool one of her master ("Are you sitting at my *desk*?" is a wonderful line, and John Normington delivers it with just the right combination of disbelief and dawning realization). So, 'The Caves of Androzani' is well plotted and characterized. But it's the *emotional* content, unusually, that really raises this story above the competition. As with many Holmes scripts, the stakes here are relatively small  Jek simply wants revenge against a single man, and Morgus simply wants to continue his brutal commercial efforts  but that just adds to the realism, and makes it seem all the more important for the Doctor and Peri to get out of there as fast as they can before they die. (After all, they have no universe to save this time.) And the tone of the story is so serious, and the subject of the Doctor's and Peri's illness treated so realistically (if subtly), that even two decades down the road, it does still feels like they're *really going to die* - it's *very* unusual for this show to give the impression of such danger, even in good stories. This makes the *Doctor's* stakes both large and small at the same time  he doesn't care about the war or who wins it, he just wants to get his friend medicine, fast, and he abandons his concern for anything else in his focus. The cliffhanger to Episode Three is so beautifully played, with the Doctor half-laughing (!) as he crashes the spaceship, but it's only one example of the sense of inescapable doom about this story  things seem to be genuinely unraveling in a way they rarely do in these stories. This feeling of grim inevitability is in fact enhanced by our knowledge that this is Peter Davison's final story, and especially for those of us who love the Fifth Doctor. As I said, I've been going through a sampling of Doctor Who stories more or less in order, and watching 'Caves' I realized that this was the first time in my survey that I honestly wasn't ready to move along to a new era. As for Davison's acting, his Doctor is at his most sarcastic here  he seems like he's asking for a punch in the face with his goading of Chellak in Episode One and Jek and 'Stotzie' through much of the rest of the story. But he is also vulnerable and humane, two of the best qualities of this Doctor, and, as others have pointed out, when he says "Adric?" just before regenerating, it's as if he's aware of his own failings in his final moments  an extremely moving thing, and perfectly in character for this fallible, sympathetic incarnation. After all this, it almost seems like an afterthought to go into specifics about the production aesthetics, so I'll only mention one: while in its design, the story is a typical studio-bound Davison story (notably, we only see the crashing spaceship from the *inside*! ), the exterior shots at the beginning are pretty amazing. The one of the Doctor and Peri walking away from the TARDIS with mountains in the distance is one of the most frankly beautiful I can recall seeing in this series, and so it's fitting that it should introduce such a memorable story.